I really enjoyed my stay at MB and in Arequipa in general. Location was perfect, beds were nice (I stayed in the 12 bed dorm), facilities clean, staff super friendly and helpfull, and last but not least breakfast was great (bread, eggs, pancakes with banana, juice, coffee and tea). Highly recommended. Really, really lovely hostel! Fantastic atmosphere and location and really nice people. The roof top terrace was fantastic and a nice place to enjoy the eggs and pancakes for breakfast and the sunset in the evening. Felt very safe. Nice place to meet people. Good balance between chill and party... Music and socialising every evening but that was usually turned off by 10:30/11. A great stay at MB Backpackers. Initially booked for one night & extended for 2 more. 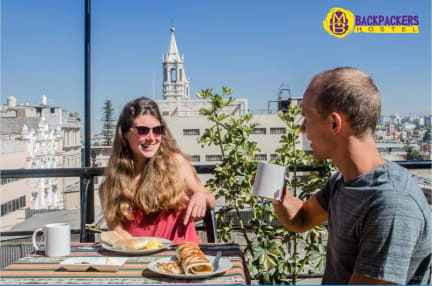 The hostel is really well located right next to the beautiful Plaza de Armas which you can see from the rooftop terrace - a great place to chill and breakfast is served up here. Thank you Juan Carlos for the great pancakes and all the information! They also have tours to the Colca Canyon, from 4 days to a shorter one day. They have info on the best Arequipa walking tour. Overall, a great hostel and great value! Location is excellent, rooftop is bonus for chilling out and partying. Kitchen is well equipped, room is spacious with socket beside each bed. Breakfast is the richest ever for a hostel. Staff are nice and helfful. Awesome hostel with crazy good breakfast and super comfy beds! Rooftop is nice and workers are very helpful. This a great hostel in Arequipa right near the plaza. The only thing, it might be fixed, didnt seem like they had hot water in showers. But it's a detail! The place is amazing. Really nice hostel and rooftop. Staff also super helpful. Socket was broke beside bed which wasn't ideal. Great location and great breakfast. Wifi was slow but still worked during my stay. Great view from terrace of sunset. Bathrooms sometimes not clean so that could be improved. Overall nice hostel to stay in Arequipa. Mixed reviews--the location can't be beat, 1 minute away from the main plaza. The beds were actually great--loved the private curtain, outlet and light that was in the dorm room. My complaint was that the bathrooms were constantly out of toilet paper, or had a light bulb burned out, or had the water turned off. Staff could have been more helpful. The location was perfect, right next to the Plaza de Armas. The breakfast was also great! The bathrooms were dirty and there were too few bathrooms for the number of people staying at the hostel. 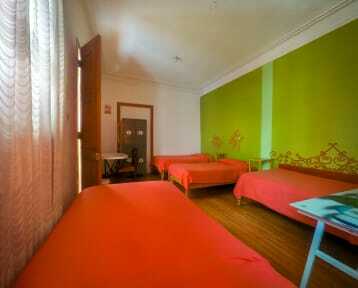 The hostel is also very noisy at night and there are no fans or air conditioning.